My DMs have been going crazy with questions regarding how I started solids with Scarlett. I post little clips on Instagram Stories of how I prep or purée her meals, but honestly the videos are too short for me to chit chat about all the steps or how I started. In this post I will tell you how I started, prep and purée everything. First off always be sure to consult with your Pediatrician when it is okay to start solids with your little ones. I am Hispanic and right when the baby turns 4 months grandma wants to start stuffing baby up with their first foods, so on that note I did start Scarlett on purées early, but I confirmed with her pediatrician and she gave me the okay as well! I started with simple veggies like carrots, sweet potatoes, and squash. Then moved on to fruits like bananas, apples, and avocado (yes it is a fruit if you didn’t know lol). I would chop up the veggies into small like cubes because it makes steaming them quicker. 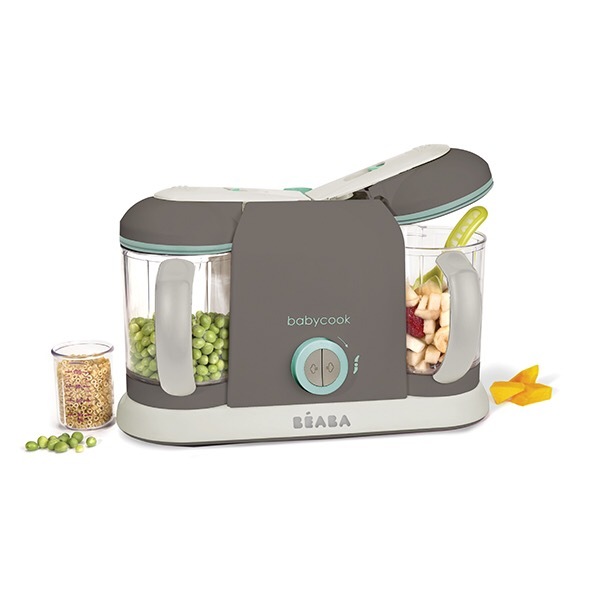 I use this Beaba to steam and purée. I cut the fruits in cubes as well and drop them in the blender. I would recommend trying one veggie per week and then fruits. To start off I wouldn’t add anything to add flavor to the veggies. Prepping is one of my least favorite things to do but its the only way I have enough food puréed in the freezer for the week for Scarlett. I use two different storing systems when I prep. I love using both of these for simple reasons. 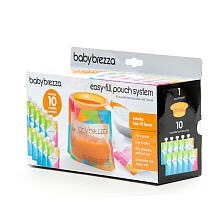 They are silicone, bpa free, super easy to clean, and super easy to pop the frozen purées out! When I start puréeing I make sure I keep all the foods I am going to use out and presentable, washed, and chopped; makes it easier that way. Scarlett is older now so I use certain seasoninngs like butter and oil if it isn’t already cooked for dinner. If I am cooking dinner and I decide to feed her what we are eating I will just blend it and feed it right to her. I do that now because she is a bit older and we are past the stage of trial and error. I pretty much already know what she doesn’t like or can’t have. (We had a case of hives and allergic reaction to some shell fish my grandmother fed her… yea the worst scare of my life that day) On that note, please please stay away from feeding your little babes shell fish/ certain seafood. After the one year mark it is okay to try feeding them it based on what pediatricians recommend. Make sure you are steaming at the correct amount of time for each food. If you over steam you are losing more of the nutrients it provides. You lose 22-34% already by steaming so yea just make sure its the correct amount of minutes. The Beaba already does this for me, one of the reasons I am obsessed! Loveeeee these spoons! 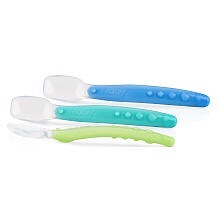 They are gentle on her gums because they are 100% silicone and the spoon itself has a wide boxy shape which scopes up food very well. These bowls are great for crazy little hands haha. Honestly, Scarlett can’t keep her hands or arms still ever, she loves to be in everything. 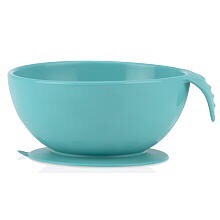 These bowls stick to the table with a nonslip base. They hold up a lot too! And the Nuby Ez- SqueeZ for at home quick fixer uppers. You can shove some fresh food and hand it off on this thing AMAZING! I hope this helps you mamas get started on solids and I hope you enjoy trying some of our favorite products that helped us get this ball rolling!